Dr. Mark Schneiderman is retiring! After 40 years of caring for patients, the offices of All County Chiropractic Center have closed as of 5/23/2018. However, Dr. Mark will still be seeing patients , during limited hours, from June 5th to June 29th, at the Family Chiropractic Center ( .5 miles away!) while his patients transition to the care of Dr. John Dowling. After July 1st, Dr. Mark will be officially retired. Dr. Dowling has 33 years experience as a chiropractor and has trained with Dr. Mark for the last several years in the approaches he has used in his practice. If you are a current patient of Dr. Mark, you will find your care with Dr. Dowling to be as close as can be to Dr. Mark without it being Dr. Mark. Dr John practices along with his wife, chiropractor Dr. Helen McWeeny. They look forward to providing a new home for Dr. Mark's patients and to providing care for new patients seeking quality care. Please visit www.flemfamilychiro.com to learn about the Family Chiropractic Center (located 1/2 mile from All County Chiropractic) or call 908-788-5050 to make an appointment! Chiropractic is the largest and most well-known of all the alternative health care professions today. It is a science based on good health being the result of a normally functioning body, especially the nervous system. By aligning the spine, undo pressure is released on the nerves. A healthy spine is one where all of the spinal joints are moving in their normal range of motion. Dr. Schneiderman has extensive training in locating these so-called "fixations" and eliminating them, so that the contingent muscles, nerves, and ligaments are all functioning harmoniously. All County Chiropractic Center is a small, personalized practice. Because of this, each patient is afforded as much time as necessary to address their particular needs. Visits are strictly by appointment and can expect a thorough evaluation and treatment with each visit. 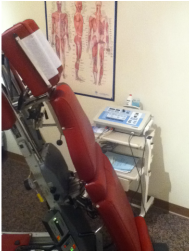 All County Chiropractic Center uses the most technologically advanced equipment on market.